People are being warned to stay away from a hotel in north Devon which was badly damaged in a fire. Fire crews from Devon and Somerset were called to put out the blaze which broke out at the derelict Montebello Hotel in Ilfracombe last Wednesday night. The building is due to be demolished, but Devon Fire and Rescue Service said some people had ignored safety barriers to take a closer look at the damage. The service said people should keep away as the building was very unstable. No-one was injured in the fire, but surrounding properties were evacuated after the fire broke out at about 1900 BST on Wednesday. Twenty fire crews from across Devon and Somerset were called to the scene. 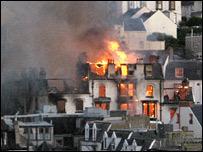 Devon Fire Service Sub-Officer Janet Booth said people getting too close to the site were putting themselves at risk. She said: "People are curious about a large fire, and I can understand that. But they really are putting themselves in extreme danger. "There is a danger of various bits of it collapsing at any time."